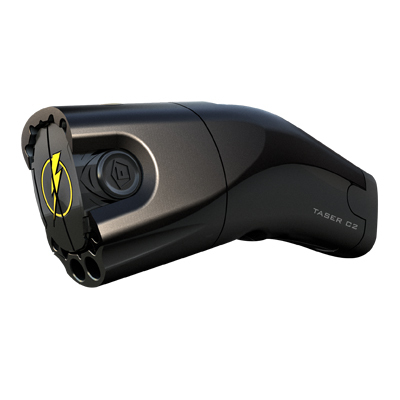 The TASER C2 is now also known as the TASER BOLT. It is available pre-owned in Black, Yellow, Silver, Blue, Red, Pink, Metallic Pink, Leopard Skin, Desert Camo and Forest Camouflage Colors. Not all colors are available at all times. Please specify your 1st and 2nd Color Choice by typing your preferences into the "Special Instructions" window that appears after entering your billing information. Please also tell us what color you will not accept, if your 1st and 2nd color choices are not available. Or call 702-617-3300 to order. The C2 TASER® fires with a range of 0 - 15' with the highest take-down power available. Free Fanny Pack - with every TASER C2 purchase when requested at the same time in the "Special Instructions" window. Restrictions - TASER® Weapons are not considered firearms and are legal in 47 states except the following. We do not ship to: HI, NY, or RI unless you state that you are a sworn law enforcement officer in the Special Instructions section. We do not ship to Canada or anywhere else outside the USA. Call 702-617-3300 for more information, for express shipping prices, or to order by phone. Your TASER C2 was originally sold in an inactive state to the original owner, but your TASER C2 will be activated and working and registered to you when you receive it. Therefore you will need to provide either your Law Enforcement Badge Number, Security Officer Guard Card Number, or private citizens will be asked for your Drivers License Number, Date of Birth and the Last Four of your Social Security Number. This process along with serialized tags in each cartridge, which is registered to each TASER C2 owner, discourage the misuse of this powerful Electronic Control Device (ECD) also referred to as a Conducted Energy Weapon (CEW).